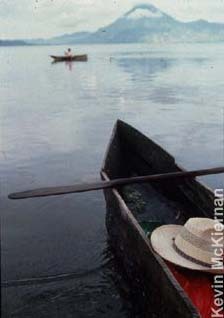 "The Disappearance of Jack Shelton"
Friday was market day in Solola, a small town nestled on a mountainside plateau. On November 27, 1981, Indian traders, descendants of the Mayans, filtered into town to sell their rugs, clothing, vegetables and coffee beans. Dressed in traje, traditional clothing with intricate woven patterns, the walkers moved slowly along the edge of the main roadway that winds steeply through the mountains. Teresa Hernandez and her 8-year-old daughter made their way to the market with the two platos of beans and rice that they hoped to sell that day. As they walked a dirt side street that leads from the main road to the village square, Teresa heard a noise and looked up with a gasp. Coming toward them was a gringo, and he was stark naked. He was running from house to house, knocking on doors, trying the locks, looking for one that would open. Down the street, someone yelled "Loco! Loco!" Teresa's daughter put down her plato of food and hid behind a tree. Teresa froze. As the man passed by, their eyes met for a split second. She thought she heard some words in English. "He was white," she remembers. "Very white." Just beyond her, the man reached an old shack. The last thing Teresa saw through the open door was the naked man by a pile of old clothes, pulling on a pair of cotton pants and tying them with a cloth belt. Around the corner, in a dirt-floor house overlooking the lake, Emilio Martin was feeding breakfast to his school-age children. When he answered a knock at the door, he saw bare feet under the crack and opened the latch, assuming that the caller was someone he knew. "That's when the tall gringo came in," Martin says. The stranger wore a pair of pants that were too short for him. He had fresh scrapes and scratches over his back and on his lower legs. His Adam's apple was large. The man looked hot and indicated in broken Spanish that he was thirsty, so Martin gave him a glass of water. The visitor shook hands with the children in the room, patting some of them on the head. He seemed friendlier than the foreigners who congregated down at the lake, but, judging from his condition and the overall strangeness of the encounter, Martin thought that he, like many tourists, might be under the influence of drugs. Suddenly, there was a banging at the door. When Martin opened it, he saw two uniformed men armed with rifles. One was from the Policia Hacienda, the feared Treasury Police. He wore the force's distinctive green fatigues and a hat with chin strap, and he carried a U.S.-made M-1 carbine. The other man wore the helmet assigned to BROE (Brigada de Operaciones Especiales), strongman Lucas' notorious anti-riot police unit. He, too, carried a weapon, but Martin could not remember what kind. "Send him out," they ordered.